The national awards scheme, organised by trade magazine Coach Monthly, and hosted by television presenter and travel and tourism expert, Judith Chalmers, recognises excellence and innovation across the coach tourism industry and includes industry suppliers, coach tour operators, tourist destinations and attractions. 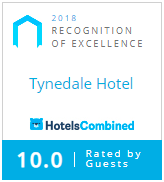 Tynedale Hotel was a finalist in the category for accommodation provider of the year that recognises an individual hotel that demonstrates a commitment to welcoming coaches, coach groups and coach drivers. Commenting on the company’s success, owners Tracey & Nathan Midgley says: We are delighted to be named finalists, years of capital investment has seen us evolve into a boutique style operation with a commitment to quality and genuine hospitality, our aim is always to exceed our customers’ expectations. We genuinely believe a hotel is only as good as its staff, no matter how nice you make it look and we are really fortunate to have a fantastic team of 40 working with us and that their hard work has been recognised by the industry.